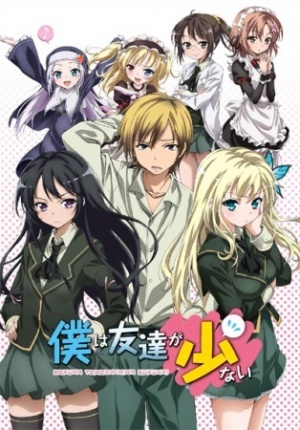 Boku wa Tomodachi ga Sukunai (known as Haganai for short) is a light novel series written by Yomi Hirasaka that has a manga adaptation serialized in Monthly Comic Alive and a TV anime adaptation by AIC Build. The light novel began in 2009. A manga series began in 2010, along with a 2-volume spinoff manga (plus) in November 2010. In 2011 a 13-episode anime series aired (one "episode 0" OVA released with the manga, and 12 televised episodes) along with another OVA released in 2012 as an add-on-disc with a later volume of the manga. A second 12-episode anime season aired in 2013, and a live film released 1 Feburary 2014. This page was last modified on 12 May 2018, at 13:08.